What does it mean to have a sense of self? 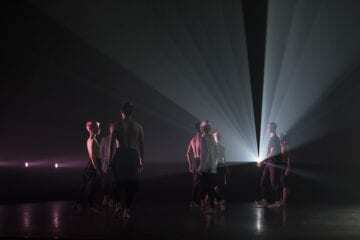 Four Atlanta-based choreographers explored the issues of identity and personal implications in Heads Up, presented by The Lucky Penny at the Dance Studio at Emory University’s Schwartz Center for Performing Arts last weekend. Divided into two completely separate agendas, Heads Up consisted of Program A and Program B on separate evenings. In Program A inside the center’s Dance Studio, Melissa Word, Okwae Miller, Hez Stalcup and Corian Ellisor, from the choreographic rehearsal space Work Room, presented four distinct works that furthered the Work Room’s mission to foster dance-making, creative research and the choreographers who are pushing Atlanta’s culture. Most Work Room productions are grounded in post-modernism. 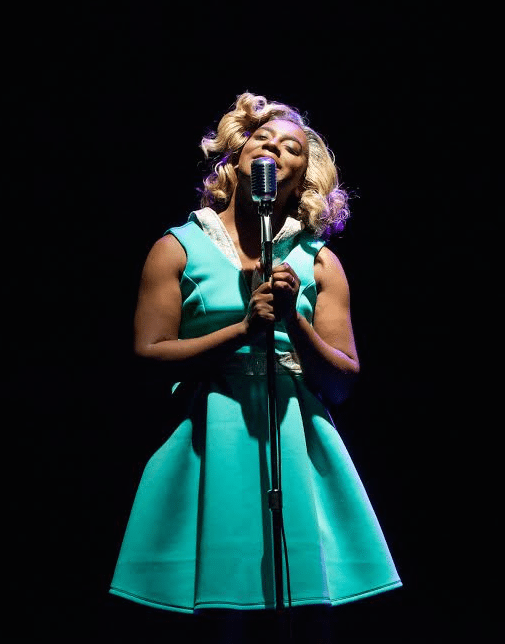 Although this aesthetic has existed since the 1960s — some would argue before — works in this vein continue to challenge many Atlanta audience members’ expectations. “more pleasant before” is part of a larger work, Country Club, which reflects on the destructive effects that white privilege can have on society. In this episode, acting and subtle, often task-oriented movements prevailed over raw kinetics. Choreographers (and performers) Melissa Word and Claire Molla began the piece innocently: the dancers encountered a plethora of seemingly random objects. As Molla interacted with the rolling exercise balls, the foam rollers and the bubble wrap, Word slowly created a recorded mix from her own speech and sounds on a loop machine. “Safe . . . secuuureeeeee,” Word’s mantra echoed; each eight-count phrase gained complexity as she recorded over herself. 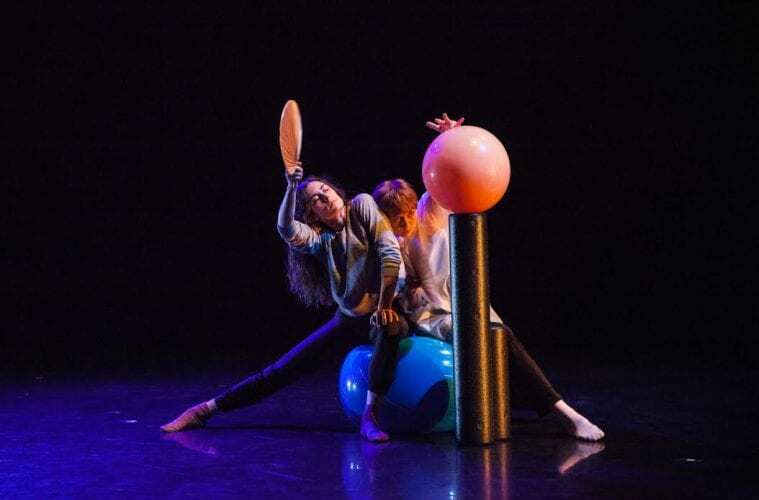 Her words faded into the next piece of music as the two dancers created shapes on the exercise balls, vying for balance on a slippery, rubber surface not ideal for staying still. At one point, the two managed to counterbalance, their heads and arms toward the center while their legs dangled to either side, finding calm before tumbling once more. The women then abandoned that notion, instead seeking to direct the balls’ travel using small wooden fans. The entire scene felt comical; particularly amusing was Molla’s repeated attempts to sit and put her feet on both of the foam rollers placed on their flat sides. She continued to fall, but persevered, eliciting more laughs from the audience members who seemed to sympathize that some of those falls probably left a number of bruises. The only moment of full-out, technical dancing was when Word placed an oddly shaped plastic bag on her arm and moved within and around it, as if testing its limitations before it would drop to the floor. This image suggests that seemingly contrasting notions of safety and power can be both contained and balanced. The remainder of the piece felt pedestrian with its more ordinary motions. Such commonplace movement could echo the indifference that results from white privilege, especially without society’s control. With music that included the Beach Boys’ “In My Room” and Brenda Lee’s “I’m Sorry,” the work appeared to embrace the sentiment of someone alone in her room, perhaps on a weekday night, playing with her toys and objects out of boredom. The dancers’ socks and sweatpants supported this idea. The mixture of eclectic music tracks, most of which had lyrics, summoned to mind the isolating effect music can have when blaring (either into a room or in headphones), allowing a person to slip into a different mentality. A certain level of vulnerability exists when alone in a comforting room. The occasional interaction between the two dancers suggested a sibling type of relationship — not constantly interacting as friends but there for one another nonetheless. Overall, this avant-garde piece was strange yet satisfying. In the second work, Okwae Miller illustrated the ubiquitous hardships of gay black men. Presented as an excerpt of a work-in-progress, three dancers personified “The g[R]ay Boi” as he moved through the emotions of oppression and self-acceptance. Three translucent sheets placed on pole supports that resembled large ballet bars stood throughout the piece, situated at different angles on stage. The dancers weaved through and around them, using them to mirror and form boundaries between each other. In contrast to “more pleasant before,” this entire work contained movement that flowed consistently. Upbeat music and continuous movement reflected a more traditional definition of dance. Rachel Silverstrim’s gentler style offset the men’s more striking moves, but the trio complemented one another. Large swinging arm gestures around their heads suggested distraction and confusion; partner work showed dependence. Together, these movements characterized remorse, inner turmoil and sorrow. As the lights faded, one man remained behind the middle sheet, uncannily invisible at certain angles. This desire to hide, or even to not exist, occasionally resonates within us all. In the third piece, Hez Stalcup offered “Man Is Least Himself.” A barbell weight bench demanded center stage, with two men in white placed on either side of it and one man sitting on it. Jeremiah Thompson, the man in the middle, rose to perform a solo, releasing fistfuls of flower petals as he approached the audience. The following section involved some collaboration, using mumbled speech. It took a second for the audience to understand their motives, but it appeared that the men were simply walking the perimeter of the stage, taking measurements and deciding what to place and where. This section seemed out of context but added humor to the piece. Simple, subtle movements strongly influenced this work, providing effective, efficient portrayal of the simplistic nature of man. However, as the music continued to swell and reached a crescendo, the movement failed to match its intensity. One dancer in particular appeared to have less technical training than the other two. While this might be a valid artistic choice in keeping with a post-modern aesthetic, it weakened the piece considerably by the end. The final work provided the most surprise to the evening of diverse styles and viewpoints. “On My Mind” depicted Corian Ellisor dressed in drag. He first performed a movement solo on a cushioned piano bench before crossing the stage to retrieve a silver mic stand and vehemently sing “Mississippi Goddamn.” A small table stood at the very back and center of stage, containing baubles that seemed to denote luxury. Ellisor placed his dress, heels and wig onto the table alongside the crown and shiny frames. He undressed to reveal a glimmering silver romper. From here, it was apparent that his song had caused him increasing anguish as he danced with exaggerated reaches and intense bursts of emotion. The work resolved as he undressed once more, wearing only underwear and a black hoodie. Still dancing, he repeated a series of phrases, which was reminiscent of Word’s mantra from the first work. These words wearied him; he eventually collapsed onto the piano bench near the table, grasping his possessions. As the final silence encompassed the audience, a few of its members cried faintly — evidence of the evening’s poignancy.